Alkham Court Farmhouse01303 892056work FarmhouseCome and spoil yourselves at our luxury multi award winning 5 star farmhouse. Relax in our indoor hot tub & sauna. 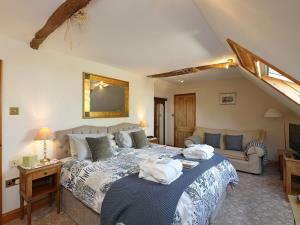 Enjoy generous breakfasts, log fire and sunsets making your stay extra special and memorable. Our four bedrooms are beautifully decorated with ensuite facilities. Each room has its own private entrance, kingsize or twin beds and ground floor rooms available with complimentary and exclusive use of the hot tub and sauna. Robes, slippers and towels are all provided for the spa barn. Excellent breakfasts cooked in our farmhouse range, specializing in local produce and served in our Oak Room with spectacular views. Guests are able to enjoy our garden, stroll or picnic in our wild flower paddock and enjoy our farm walk with wonderful views. 10 mins from Dover and the famous 'White Cliffs'. 20 minutes from Canterbury. Excellent touring base. Ideal for short breaks. Featured in The Sunday Times, Great British Weekends and Enjoy England's 100 finest places to stay in England. ONE NIGHT BOOKINGS MAY BE AVAILABLE PLEASE TELEPHONE FOR DETAILS.